* Total number of reviews and star-ratings are based on data collected during the time period The Pink Plumber - Tampa has been using the ReviewBuzz system and may not directly match the data found on each public review site. Felix R. was very professional, I really appreciated the fact that he cared that when changing out the old bathroom fixture it was clean for the new fixture so as not to show any old lines from the old fixture. Everything was cleaned up and it looks updated and great! He was prompt, knowledgeable and courteous. So glad I called Pink Plumber. Scheduling was quick and easy. Technician was on time, assessed my needs, and gave me an acceptable quote. Technician very courteous and advised us of what he would be doing that would impact us. Do not hesitate to call Pink Plumbing. My tech G and joe are the best plumbers I’ve ever met do to the fact they did not tear no floors and walls up like the other plumbing company said to do my water lines thanks for the precision work! Reliable and did decent work, but their pricing isn't competitive. I can't say enough how awsome Les C. was. So professional and upfront about all the costs. Thank you so much! Recently had our 15 year old water heater shell out, with smoke rolling out of the bottom. Luckily our son discovered it before we had a fire break out. Called the Pink Plumber the next day and spoke to a nice gal who sent out a tech to assess the situation immediately. Felix arrived and looked things over and gave us a quote on new water heater and a softener my wife had been wanting since we moved in. He and another fellow came the next day and did a fine job, cleaning up after themselves and leaving clear instructions on care and maintenance. Will definitely be using them again if we need plumbing help. Felix and Joe were very professional and explained everything very clearly! I would give this technician 100 stars if possible. Very intelligent, personable and socially adept. He let us konw what was going on from the very beginning. Found the problem, solved the problem and let us know what we missed while attempting to fix it before his visit. I will only use this plumbing company in the future and ALWAYS ask for this technician! Best experience with house repaire ever! Robert handled a unique install of a whole house filter along with a non-salt, sealed softener, with both a pre and post filter, and he had to put it in a small closet with an existing water heater that needed to be moved. The job was complex, and required creativity along with self-confidence. Excellent job, and a work of art when he was done. Oh yeah, and then there was the RO system he put under a sink. Just all-around superior craftsmanship, clean, and focused. My only call from now on, and more than willing to vouch for him if he needs a reference. Outstanding service from The Pink Plumber. My concern was heard and addressed on the same day and service professional Dominic D. was very quick, thorough and pleasant from start to finish. He never pressured me with a service agreement in fact, he gave me three options for repair. I will gladly refer this company to anyone needing a good plumber! Though this call was for my business location, I will be sure to call them for my home as needed also. Highly recommend! Customer service is always a top priority at The Pink Plumber - Tampa. Our BBB Membership rating is like a badge of honor as we continuously strive to provide the best experience for our clients. Thomas S has a 5-Star rating and leads the company in total reviews, making this pro a ReviewBuzz Rockstar! Hello, my name is Thomas, but everyone calls me TJ. I've been plumbing for a little over 16 years. I became a plumber because I like working with my hands and finding solutions to other people's problems. I enjoy being part of the Pink Plumber team because they hold high values towards their customers. Excellent work, professionalism, punctuality and friendliness. TJ is a great plumber and a nice guy who cleans up after doing his work, which we customers really appreciate! I really have great confidence in him when he explains the problem he finds and how to fix it. I simply cannot afford to fix every problem when he finds it! I will call again and request TJ as the serviceman. Thanks for such good work, Thomas. Mr Salvato was very professional and knowledgeable about his job. He very patient with us and answered every question we asked. T.J. was very knowledgeable and professional. He explained what needed to be done and took care of the problem efficiently. 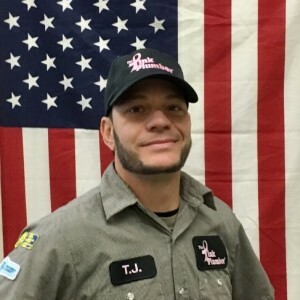 TJ is an amazing professional, he’s got a team moving like no other, leak detection, restoration, my home will be what it used to be because of TJ! Very professional and knowledgeable! We had to redo our kitchen sink plumbing on Saturday. TJ was professional and explained our options to us. Schedule Reps had followed up with us via email / Phone call to make sure our plans has not changed. TJ came on-time and completed the work in allotted time frame. Glad to know I also supported an important mission, the company gives back to the community by donating to breast cancer research. TJ came out to do a total house repipe, and he went above and beyond to help us and make sure the job got done correctly. We are onlu using him from now on. Very professional and willing to work until the job got done! Thank you again TJ!!! Thomas was phanominal and made my problem his. Explain the details and made the stress that accompany plumbing emergency pain free. Thomas provided us with phenomenal service! He was very thorough and treated our plumbing problem as if it was his personal plumbing problem. Thank you! T J is,without a doubt,one of the best plumbers I have ever had do work at this house-ever. He was helpful with suggestions and he WILL be back because I have a lot to do around here. Marat with the Pink Plumber was Awesome! He is professional, knowledgeable and skilled at his trade. I was very impressed with how respectful he was to our home and even put shoe covers on to walk through our house. He did a great job removing our old toilet and installing the new one. Marat definitely goes the extra mile to make sure you are happy with the work performed and even cleaned up everything when he was finished with the installation. I can definitely recommend Marat and the Pink Plumber with absolute confidence! Tj was great! Knowledgeable, efficient, professional and friendly. The Pink Plumbers are 5 Star all the way. I highly recommend them. They are our Plumbers from now on. T.J. was great. Very nice, knew what he was doing and got right to the job. And he finished before I expected him to. Thanks T.J.!